It has been described as a game changing deal in the aviation world. As Qantas Airways’ 17-year revenue sharing agreement ends with British Airways, a new chapter begins right here in Dubai. Noni Edwards has the story. 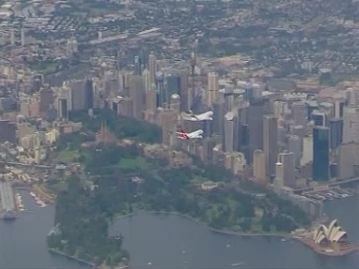 High in the skies over Sydney, a Qantas A380 pilot talks to his Emirates colleague as they stage a daring double flyover. 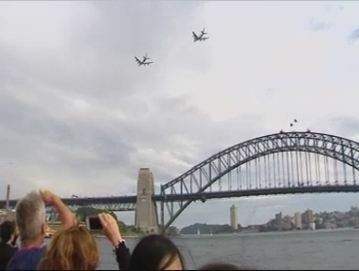 It’s symbolic of the spirit of cooperation between the two airlines, that’s being celebrated today is thought to be the first time anywhere in the world that two commercial A380s have been flown in formation. There was no mistaking just how big a deal this is for the Australian carrier either. Analysts have suggested the alliance could save the Australian airline up to A$ 100 million a year. Qantas has already reported a six-fold increase in bookings for flights to Europe over the past nine weeks, in the lead-up to today’s launch. And the sheer grandeur of today’s occasion was not lost, even on an industry stalwart. The pilots reportedly practised by flying the route dozens of times in sophisticated flight simulators. Qantas pilots have also been putting in the hours preparing for their new destination, with a simulator designed specifically for Dubai, ready for tonight’s first-ever scheduled flight, currently en route and expected to land here just after midnight. Customer service staff have also been training together, learning about the similarities and differences between Skywards and the Qantas Frequently Flyer program, treating each other’s customers as their own with the aim of giving everyone a seamless experience. The powerful alliance has great potential to shake up the global aviation business. 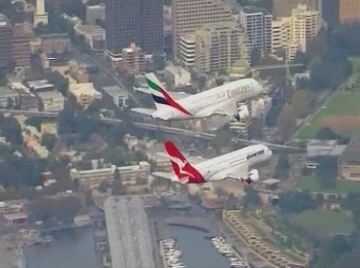 It represents the joining of forces of two of the world’s top twenty airlines – Emirates ranked at number 8 and Qantas at 15, according to Skytrax. Because of the extraordinary market share the two will be working to achieve, the deal needed approval not only from Australia’s competition regulator, but Singapore’s as well. Qantas flights to and through Changi International have been largely “restructured” as Emirates codesharing comes into play and Dubai becomes its new hub for all sectors to Europe. But there aren’t many complaints Down Under. Australians travelling to Europe via Dubai on either airline, can now get there more than two hours quicker, on average. This entry was posted in Australia, Dubai, UAE and tagged A380, alan joyce, aviation, dubai, dxb, emirates, flight simulator, frequent flyer, loyalty program, pilot, qantas, skytrax, skywards, superjumbo, syd, sydney, tim clark. Bookmark the permalink.